Established in 2005, Legacy Construction, Inc. is a driven and dynamic construction company, with capabilities and expertise in energy efficient and environmentally conscious vertical construction, including LEED, Energy Star, mechanical and electrical retrofit, and multiple renewable energy solutions. Legacy’s staff and team members include green engineers, construction managers, business professionals, and asset managers experienced in all areas of construction, contract types, and contract management. Further, we have a full complement of qualified sub-contractors to augment our in-house capabilities, which enables us to meet and exceed our clients' expectations. At Legacy Construction safety is paramount. 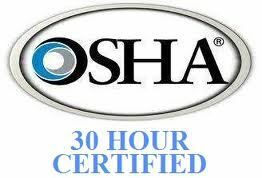 Our professional are OSHA 30 trained and we're proud of our team's exemplary track record of safety on all projects completed to date. Specifically devised for safety directors, foremen, and field supervisors; the program provides complete information on OSHA compliance issues. Legacy Construction has completed housing, commercial/retail, institutional, recreational and educational projects in both the private and public sector for numerous clients across the Southeastern United States. Here are a few of our partners. Please contact us directly for a complete listing of Legacy Construction NAICS Codes. "Legacy Construction did an outstanding job with installing a 20 Ton unit. All the work was done in a professional manner. All time lines were met and the job performance throughout the time period was outstanding. They kept me abreast of everything that was taking place on a daily basis. Their overall performance during this job was exceptional." Please take a moment to share your contact information and interest in the form below. A Legacy Construction Team member will respond to your needs as promptly as possible. We look forward to hearing from you!